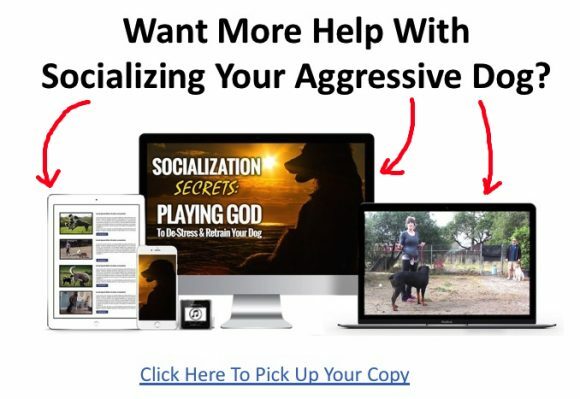 Do you have a dog who doesn’t seem to be learning how to behave as quickly as you’d like, and you’re concerned that if you don’t figure out how get through to him his behavior is going to keep getting worse? If so, don’t feel bad! Getting stubborn dogs to learn how to be calm, obedient, relaxed dogs is really hard to do if you don’t understand how to read dog body language. Obviously, this is an example of a dog showing body language that leads to aggressive behavior. But, dogs show many other types of body language signs too… like fear, happiness & stress. By learning how to read this canine body language and reading your dog’s entire body, life with your dog stops being a one-way conversation and creates a shared communication between pets and their owners. Knowing that this Secret Dog Body Language Exists, What Should You do About It? Well… have you ever been in a situation where you had to try and communicate with someone who didn’t speak the same language as you? Like maybe you tried to learn where the bathroom was in a foreign country and the person you asked didn’t speak English? Maybe you did some pointing? Maybe you crossed your legs to act out that you ‘had to go’ to get the point across? In most cases, whenever we humans know we’re not being understood, we try to find some sort of a common language. We know there’s a language barrier, so we turn to other types of communication. What “language” do canines understand? … vocalizations are NOT the primary way dogs communicate and learn from each other. The primary way that dogs communicate with each other is actually more through NON-verbal communication. What we tell our clients here at TheDogTrainingSecret.com is that if you have a dog who is ignoring you, it’s usually because dogs don’t listen with their ears very well… they actually “listen” more with their eyes. Now don’t get me wrong, I’m not saying that dogs can’t learn to listen (I’ll actually show you how to get them to listen later on)… I’m just saying that it’s not the DEFAULT way dogs communicate. To show you what I mean here’s a simple ‘Turning Head’ test you can perform on your dog to see if your dog has this same type of listening problem. By turning your head away from your dog so he can’t see your mouth or your facial expressions, you can find out if your dog was actually listening to the words you were saying, or just reading facial expressions. Pretty crazy huh? My dog wasn’t listening at all! He was reading my facial cues! So the second I hid them from him, he was essentially DEAF to my commands. And many, many dogs are like this. This happens because dogs are experts at nonverbal communication. They are constantly using their eyes, mouth, tails and body posture to try to tell us how they’re feeling. If we want our dogs to learn behaviors as quickly as possible, we first need to get better at understanding the nonverbal communication signals they’re sending us ALL day long. 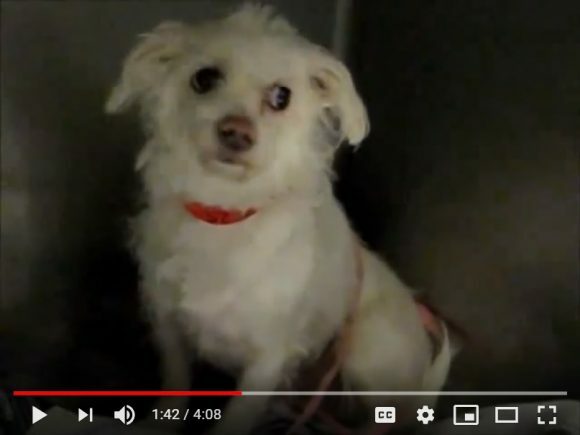 When learning to read your dog’s eyes, you need to be able to identify the three different types of eye cues dogs give you, which are Neutral, Aroused/Anxious, or “Whale Eyes”. Here’s a great video on reading dog eye cues. See if you can look at the image below and match the pictures of dog eyes to the appropriate eye cue type. Also… watch for dogs who look at you from the corner of their eyes, or avert eye contact. This is a common look for dogs who are feeling fearful. It’s also common for these types of dogs to keep their mouths closed tightly, and hold their breath. If you see a dog doing these things, he’s telling you he’s scared! Remember, if you see a dog exhibiting signs of fear or stress, they will typically respond in one of three ways: fight, flee, or cower. Humans are pretty bad at actually noticing these signs in dogs. So bad, in fact, that a recent study of dog experts who analyzed dog body language signs in social media pictures where dog owners were hugging their dogs, noted that 80+ percent of dogs were showing signs of stress while being hugged. And the owners had no idea! Learning how to spot these signs is going to make your pooch’s life so much less stressful! Tail wagging to a dog is like facial expressions to us humans. So just like how we know a smiling person is approachable, and an angry person should be avoided… dogs get that same information from a tail wag. How high a dog’s tail is can be a pretty good way to gauge the intensity of your dog’s emotions. If your dog’s tail is middle height he’s in a pretty relaxed state. If the tail goes straight up, the dog is getting too excited or upset; and the lower it gets the dog is getting more upset or anxious. The direction your dog’s tail wags, and the speed at which he wags his tail mean different things too. For example. 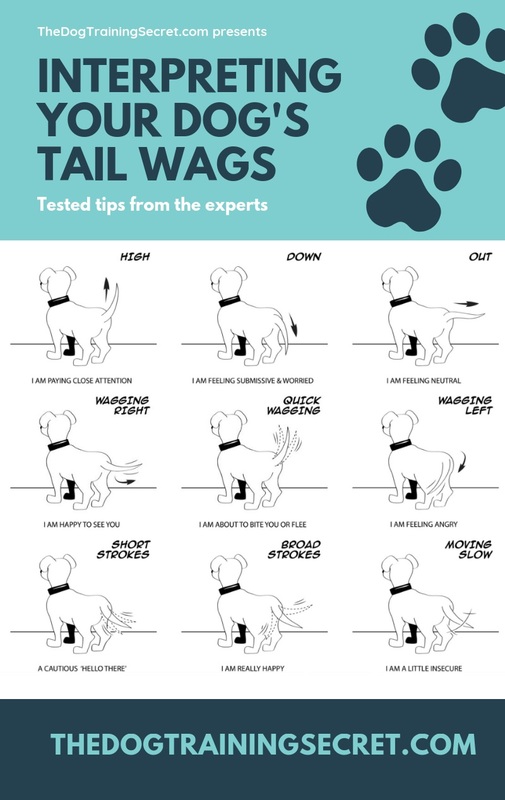 a tail wagging to the left, like in the images below, is a negative tail wag. A dog wagging his tail in this way is in a negative state of mind. A tail wagging to the right says the dog is in a positive state of mind, and a tail tucked between his legs means he’s feeling submissive. 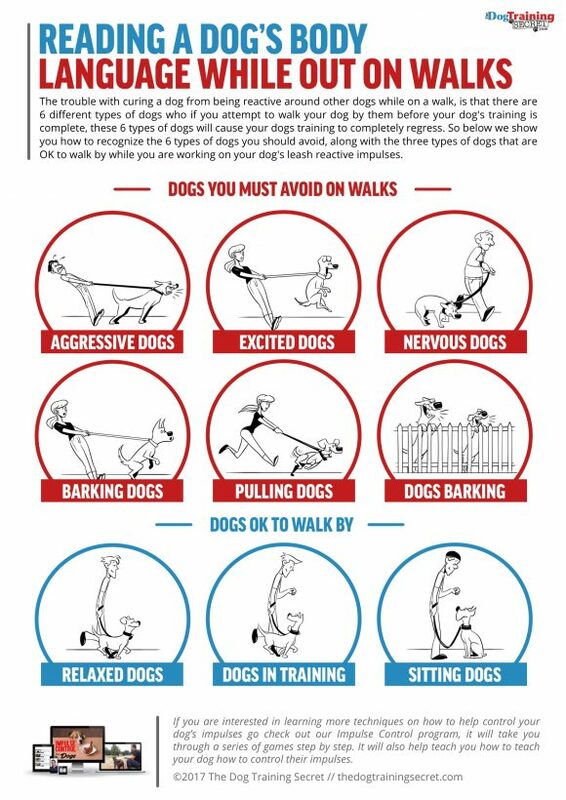 I recommend taking this chart and starting to pay attention to other dogs while out on walks. See if you can gain some more insights into their emotions. The first time I did this, it was like those videos of people who have their ears cured and hear for the first time; because you realize there is this whole level of communication that your dog has been trying to tell you that you never new about. It’s really pretty cool. There are a few reasons you want to make sure you learn how to interpret a dog’s posture. The first is if you are interested in socializing your dog to other dogs. Socialization is a two-way street with dogs. You need to be able to look at your own dog and read his comfort level around other dogs so you don’t push him too fast and CREATE an anxiety issue. But, even more important, you need to be able to read BAD dog behavior from afar, so you can avoid them. You don’t want to blindly let your dog walk up to a dominant dog only to end up having to break up a dog fight. Here at TheDogTrainingSecret.com we teach a pass/no-pass philosophy to people who are training their dogs how to properly interact with others out in the world. What pass/no-pass means is that we want to stay VERY far away from dogs with certain types of posture, as we can tell that they are likely to lunge, bark or attack our dog if we get too close. When people make this mistake and allow their dog to have run-ins with dogs like these, it builds their dog’s anxiety “Head Trash” when they see other dogs (this is especially important when working with a new puppy). So, instead of praying that a dog-to-dog interaction will go well, just walk far around these types of dogs, or step off the side of the path and stay far enough away to prevent an accident. Also… if you notice YOUR dog doing any of the behaviors in the RED zone on the above graphic, please do other dog owners a favor and steer clear of other dogs, as your dog is not yet ready to interact appropriately. You won’t be doing either dog a favor if you try to approach a submissive dog who’s hiding behind his owners legs, or who seems overly excited to play. Usually, if you follow those large posture cues you’ll be doing pretty well. But there are some other, more subtle, body language cues that you’ll want to learn how to spot. A dog’s posture is the next thing you need to pay attention to, specifically, if you are trying to read a dog who has fear, anxiety or aggression. As with all cues, some can be subtle, and some are more obvious. And to help you know what each of these looks like, here’s a video that shows you examples of each. Are you starting to see why learning to read your dog’s body language is so key in helping him learn how to behave? Who would have thought that whether or not your dog licks his lips too much was a warning sign, right? What Should You Do When You See Signs of Stress in Your Dog’s Body Language? When your dog’s body language suggests he’s stressed, we believe in using a handful of different strategies for helping them overcome their fears and anxieties, by working ‘Below their Emotional Threshold’ with low level stimulus. We even built a whole course around this called Impulse Control that you can check out here. Let’s say you have a dog who is fearful or anxious around other dogs. In that situation, take your dog to an area where you know dogs will be, like a park or trail. Experiment with how close you can get to other dogs before your dog starts to show body language cues that he’s feeling stressed. Let’s say in this example that is 30 feet away, and you notice your dog start to lick his lips all of a sudden when he’s that close to another dog. If 30 feet is the distance where your dog starts to feel stressed, then that’s the place we need to start! If we try to push it and force our dog to work through his fears while he’s 10 feet from the other dog, that’s too much emotional intensity for your dog to make progress. There is a very popular dog trainer on TV that has made a name for himself by using video editing to make it look like he can fix fearful dogs by dominating them and forcing them to submit to his ALPHA will. I cannot even begin to express how dangerous, and harmful, these approaches are to your dog’s ability to have emotional resilience. When you take the approach of forcing your dog to confront his fears full on, and at their full intensity, you get one of three responses. Your dog will try to flee, fight or cower. Just like you wouldn’t take someone with a fear of spiders and lock them in box full of Tarantulas (in the hopes that’d they’d just ‘get over it’), we don’t want to flood our dog’s emotional system with overwhelming fear and anxiety. Doing so actually makes it MORE likely that your dog will become MORE fearful, anxious and submissive. Like these poor dogs who’ve been trained to cower submissively by a dog trainer who uses electric shock as a consequence the second their dogs get out of line. Is this what you want your dog to look like? Instead of using methods like the trainer above, we want to use training methods that teach our dogs to be calm and relaxed when in the presence of things that get them overly emotional. We want dog’s that look like this while out on a walk: happy, calm and well adjusted, and NOT like the video above. 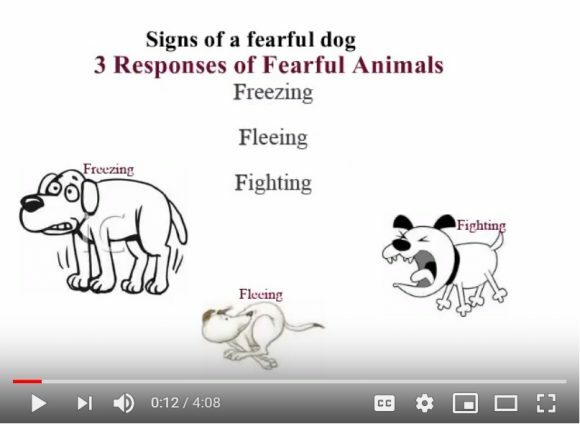 By taking the time to learn how to read the different types of anxious, excited, fearful and aggressive body language that dog’s are displaying, we take a HUGE leap forward in our ability to be better communicators with our dogs. Better communication leads to a deeper bond, and more obedient behavior.